Here's another favorite fattening food from my mom, Marilyn. I don't remember her making this much when I was growing up. I only remember it starting from the time I was in college or so. I'll have to ask her when and where she got this recipe. As with many of my (and my mom's) recipes, they've never really had exact measurements, so this is another best guess. 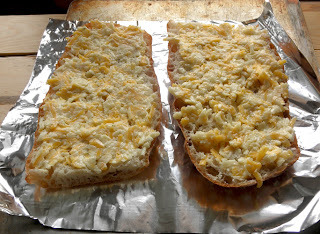 I rarely make an entire loaf of cheese bread either because it's just too good, and nobody needs that many calories in a short period of time. It is a nice treat once in a while, though. THAT's for certain. 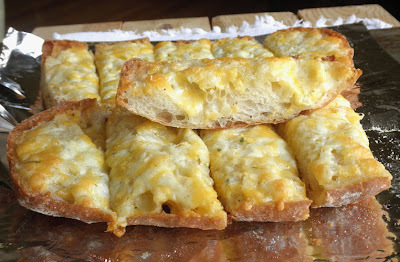 There are probably plenty of great cheese bread recipes out there. I just want to keep track of this one since I've never written it down. The ingredients here are so simple, I don't even think I need to describe the product to you. It's just yummy bread made yummier with butter, cheese, and garlic salt melted onto it. For the pics you see here, I used some homemade ciabatta because I had it, and because I actually ruined the loaf by forgetting the salt. Grrrr. It needed to be made into something else. 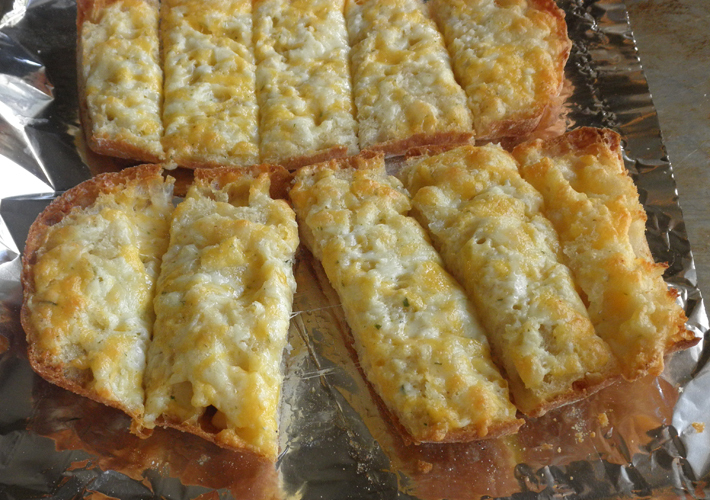 So cheese bread it is! Slice the loaf of bread lengthwise so you have two large halves that lay down relatively flat, cut side up. In a large bowl, stir the cheeses, butter, and garlic salt together until thoroughly combined. Garlic Cheese Ciabatta ready to go into the oven. Bake at 400 degrees for about 10-15 minutes, or until melted and bubbly. You can also just turn on the broiler and keep an eye on it, but then the bottom doesn't get crusty at all. If you like softer cheese bread, then go for the broiler. Remove bread from oven and cut with a sharp heavy knife using strong downward strokes--don't try to cut it with a serrated knife. Makes about 10 servings, I think.